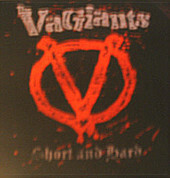 With what can best be described as a "sophomorically clever" moniker, Canada's VAGIANTS debut album "Short and Hard" is a keeper. On tap are nine tracks of snotty punk rawk driven by the massive lungs of the diminutive J-Rod, a lady whose voice is as addictive as meth. Each tune on here is memorable and has enough hooks to catch your attention yet enough grit and grime to win your respect. VAGIANTS join L.A.W. as the absolute cream of the Sin Klub crop.